The Tea Party has grown partly in response to ballooning deficits and what they see as irresponsible government spending. Well, the Center on Budget and Policy Priorities graphs data from the CBO to illustrate where our massive deficits originate. While partly to settle the “blame game,” this also helps us figure out how best to combat the deficit (if that’s really someone’s concern; looking at you Tea Party). Any fair observer can see that the economic recovery measures (lighter blues) are not the cause of out of control long-term deficits. The economic downturn and Bush’s tax cuts are the major issue. My solution: fix the economy (ok, easier said than done) and raise future taxes with a VAT. It should be clear that if solutions to fix the economy involve spending money that should not be a valid concern – a healthier and productive economy will help diminish the deficit more than any spending will contribute to it. 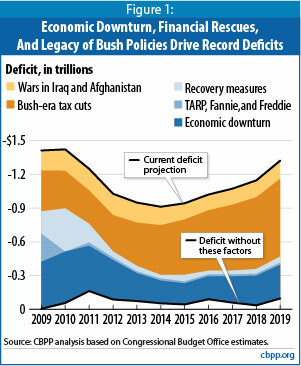 Although I agree to a certain extent that the Obama administration shouldn’t focus on blaming the Bush administration for the deficit, The New Republic points out… they’re not wrong. Now, I think it’s fine for a story to eschew “balance”when one side is making an unsupportable or hypocritical case. But Obama’s case isn’t wrong — it really is true that the economic and budgetary problems we’re facing were inherited from the previous administration. What’s false is the Republican effort to imply that Obama caused the problems — an argument that collapses upon the slightest empirical pressure. But somehow the standard here is not what’s correct but what’s polite, and it’s impolite for Obama to blame Bush.